Bundesmann refus water-borne tester, and it can detect fabric on friction and turning process of artificial rain water-and water performance. Through the fabric of water by sample testing before and after the weight change and obtained. The instrument has four in test cup on test head (diameter 100mm), in fabric below the rotation of the device can simultaneously simulation exert friction role. Artificially rain from distance sample of more high 304 copper nozzle spray on fabric and above. 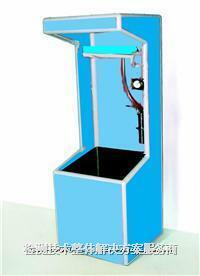 Centrifugal machine for rating can remove excess water samples surface.